Faith Durand, Columbus based managing editor of the popular website The Kitchn has written a great new cookbook. Not Your Mother’s Casseroles is a new look at the one-dish baked meal and as well as easy dinners it also contains a lot of tempting breakfast casseroles. There are lots of new takes on traditional casseroles, including a reinvention of green bean casserole but also plenty of fresh ideas. 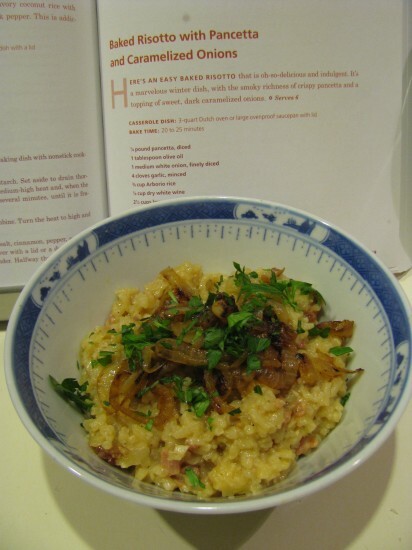 I wanted to try one of the recipes before I posted about the book and this week I made the baked risotto with pancetta and caramelized onions, substituting Thurn’s double smoked bacon for the pancetta. The recipe was a success, although (I hesitate to admit) that it said it fed six and two of us ate the whole thing. The recipes, of which there are over 200, are clearly written with detailed descriptions and lots of handy tips about ingredients and equipement. The book is mostly baked casseroles, although there is also a section entitled ‘while it bakes’ with salads, breads and soups. After my initial foray, I’m looking forward to trying more of the recipes, especially the breakfast dishes. 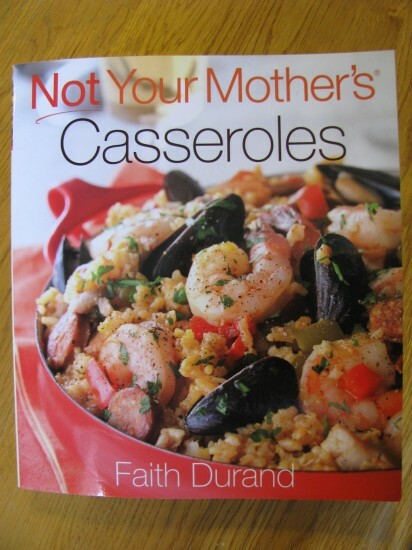 We have a copy of Not Your Mother’s Casseroles to give away. To enter please leave a comment telling us about a casserole your mother made or a childhood casserole memory. To enter you must live in the United States. 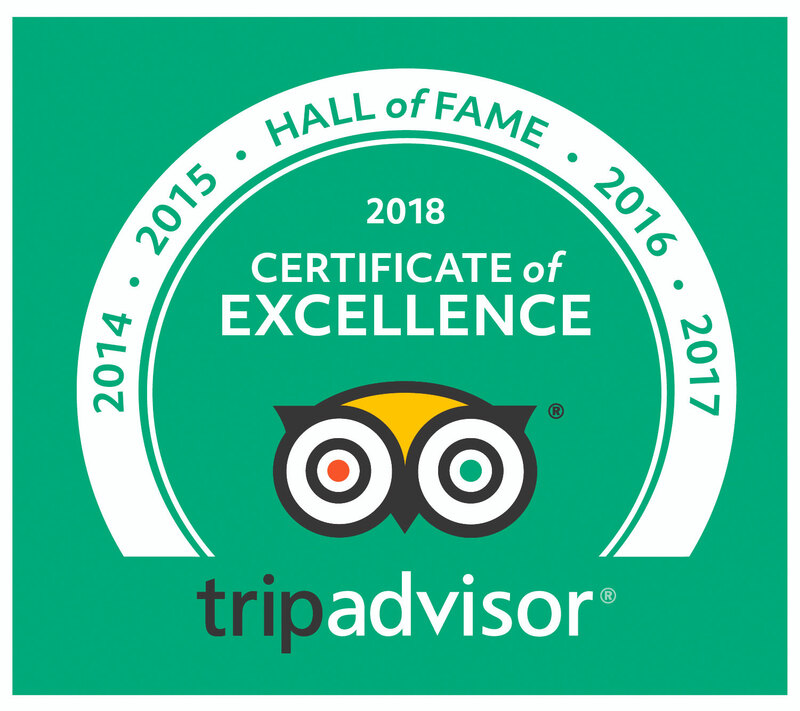 Entries close 10pm Thursday February 3rd. My mom made tuna noodle casserole when I was a child. I loved the baked bread crumbs she put on top! I never liked tuna plain, but it was always yummy in the casserole! tuna noodle casserole. Haven’t had it in years. My mom used to make ‘tamale pie’ as a quick go-to dinner. It really has nothing to do with tamales, but the cornbread topping is so yummy! Now that my mom is no longer with us, my sister always calls to tell me when she has made one of Mom’s recipes. Eating Mom’s food just makes you feel a little bit closer to her. Mom used to make a great “pizza” casserole that was always a favorite! Tuna Noodle. My favorite until the night we had and then I got the flu…. I was never a fan of casseroles growing up, perhaps because my mom only made tuna noodle and green bean casserole and I wasn’t fond of either. Would love the opportunity to try a new version of some of these old classics! Being the youngest of seven kids, I’ve eaten a LOT of casseroles! I loved them then and I still love them now! I remember one that my mom made that had Buddig beef, egg noodles, cream of mushroom soup, a little milk and I think it had cheddar cheese. It was so good and I loved it! Wonder if I still would today? Brown and drain the beef. Remove from skillet, saute vegetables in a small amount of oil. Add beef and mushroom soup. Thin with milk to desired consistency (should be slightly soupy). Season to taste with salt, pepper, and soy. Simmer until thickened slightly. Pour into a 9 X 13 pan. Top with 1/2 the chow mein noodles. Cover tightly, bake for 30 minutes @ 350°. Remove foil, add remaining noodles, and bake uncovered until browned. Now, this is all from memory. Nowadays, I add a little garlic and grated ginger. If anyone is interested, I can throw out a couple of more recipes. My mom got a recipe for “Yummy Potato Casserole” from the pastor’s wife, who had three sons. If anyone could come up with a recipe for a cheap, filling casserole, it was her! My Mom was a fan of the tuna noodle casserole and frankly I was not. Congratulations to Laura D who was picked as our random winner. I hope you will enjoy trying out Faith’s recipes. I was SO disappointed when I got to first grade and had to eat the “normal” recipe for Johnny Marzetti! I grew up on a farm where my Dad raised all our own meat and vegetables and Mom canned or froze just about everything he brought into the house. She made the best roasts with mashed potatoes and noodles – followed the next day by HER version of the famous casserole. It included left-over browned and tender pork shoulder meat, her chunky homemade noodles, fresh sliced mushrooms, whole tomatoes canned from our garden and crushed into the dish, green peas, left-over roast pork gravy, a few mashed potatoes for thickening (if we had any left over) and it was topped with Parmesan cheese before spending an hour in the oven as all the flavors mingled. It was the BEST casserole on the face of the earth – and those cafeteria ladies did NOT make it like my Mom’s! SHE made the REAL Johnny Marzetti and it’s still the best casserole I’ve ever eaten!